Whether you’re in the city or the suburbs, industrial loft furniture can give your home an edge. 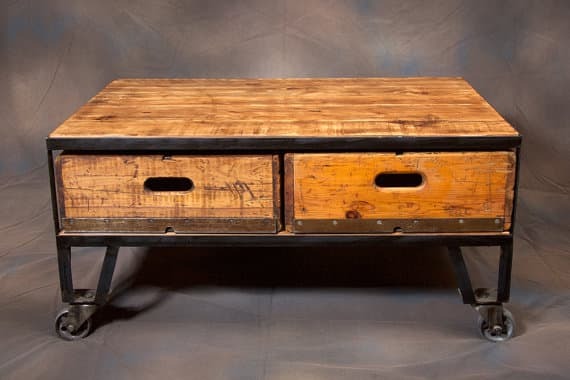 Not only does this coffee table have the industrial elements of repurposed wood and a metal frame, but it also has the added benefit of storage! The crates are the perfect place to hold remotes to keep them from getting lost. The distressed wood gives you the vintage repurposed look and the metal frame gives you a clean, but rustic edge. The wheels give the coffee table a cart feel. This helps it to feel like a repurposed piece overall. If you have a studio loft and want some added privacy, consider utilizing a large shelving unit. This piece of multifunctioning furniture helps you to save space by combining your storage and giving you privacy. This shelving unit pulls in industrial design elements by using repurposed gas pipes as the frame and dried pine as the organic element. The minimalist design keeps the wood and metal combination from feeling bulky. It is perfect for holding a book collection, small light fixtures, or plants to add life to your loft. The open sections of this shelving unit allows light to pass through from one area to the next. This helps the loft to feel more open. The last thing you want is for your loft to feel closed off and smaller than it really is. The solid sections still provide the privacy that you want for your bedroom area. If you live in a loft, you know small apartment organization is important! This desk has the added advantage of vertical storage. 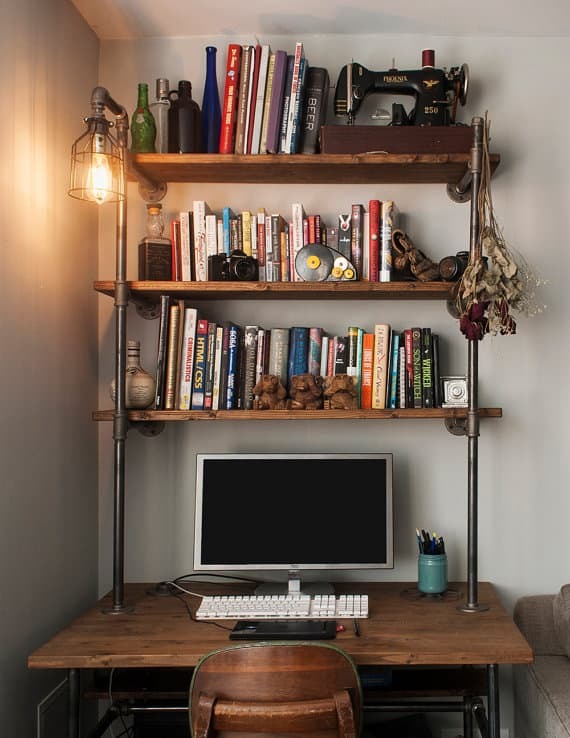 The shelves above the desk uses space that wouldn’t be utilized normally. The frame is made up of repurposed industrial piping. The wood of the desk and shelves are reclaimed wood. The unique feature of this desk is the built in light fixture. Edison bulbs are popular accents to industrial home design. This particular light is paired with a vintage bulb cage. The wires are hidden in the pipe. This is the perfect work space for those who are also looking for extra storage that fits into their industrial loft. It can be said that this table is the definition of an industrial piece. The table is made up of several different parts, making it completely unique and one of a kind. The feet of the table were taken off of an old hall storage unit and feature lions’ heads in the design. This gives it a unique Victorian flare. 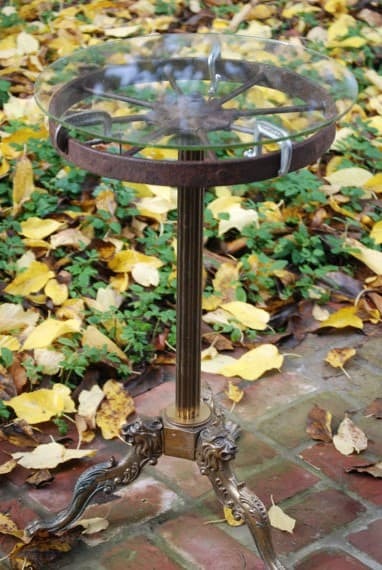 The table base of the top is made from a repurposed farm wheel and vintage “C” clamps provide a platform for the glass. The rest of the table is made up of different repurposed metal pieces. This mixture of materials fits well into an industrial design aesthetic. The glass top keeps the table from feeling too heavy. A round table fits well into many different spaces and can work as either a side table in your living room or as an entry table next to your front door. 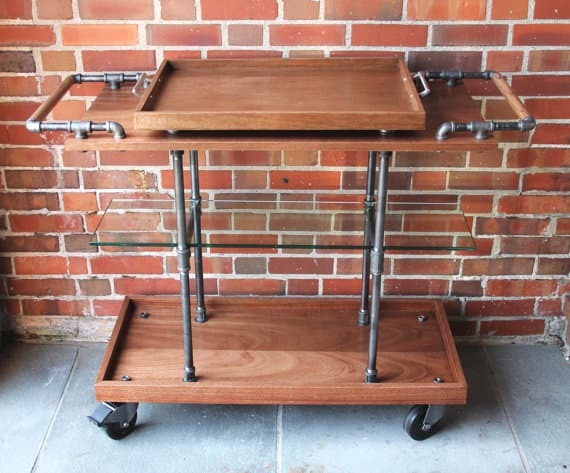 A popular trend in home décor is the mobile bar cart! This set of shelves on wheels is a trendy and convenient way to entertain when you don’t have the space for a built in bar. By keeping it on wheels you can move it out of the way when needed. This particular design fits seamlessly into an industrial style loft by using a combination of rich warm toned mahogany and steel pipes as the frame. The wheels lock to keep it from rolling away in the middle of use and the middle glass shelf is perfect for displaying your glasses. The top detaches to become a serving tray if needed. This versatile piece isn’t just limited to being a mobile bar. It can be used for all of your entertaining needs, from other beverages to plates and silverware. This is the perfect accent to any event you may be having. Extra shelving is always welcome in any home, whether it be a loft or house. The key is to find shelving that looks like it belongs in your space. While most industrial loft furniture features repurposed pipes, reclaimed wood is just as popular. 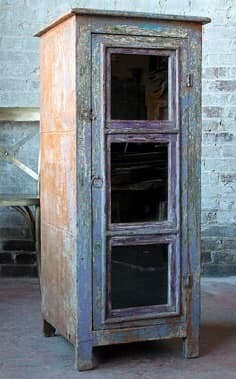 This cabinet uses an antique cabinet that has kept its vintage style with the distressed paint. With all of the dark elements that are coming in industrial lofts, you want to keep cabinets and shelving short to avoid completely closing off your space. This particular shelving unit is under 4’ and has a glass front keeping it open. The glass panels at the front of the cabinet makes it the perfect choice for a media cabinet. However, this design would fit perfectly into a bedroom or bathroom as a stand-alone linen closet, or in your dining room as a china cabinet. If you have the room, an industrial dining table is the perfect centerpiece for your loft. It gives you a large space to feature reclaimed wood. With a simple metal frame, the uniqueness of your wood and its distress patterns can truly be showcased. This design also includes matching benches. Benches are common in industrial spaces, rather than individual chairs. To create a cohesive home design, bring the industrial style into your bedroom design as well. If you want to keep your home from feeling monotonous, pull in different industrial design characteristics in your bedroom. Repurposed pipes are always popular details, but take a break from the usual black finish. 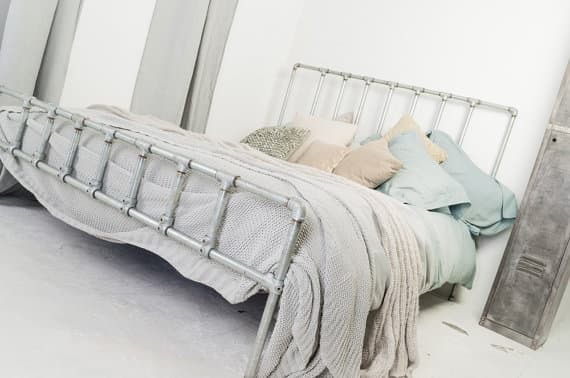 The steel pipes on this bedframe are galvanized and have a metallic silver finish. This breaks up the dark décor that usually comes with an industrial loft. Keeping light colors in the bedroom helps you to feel refreshed in the morning and makes the space feel larger. This simplistic bedframe appeals to the minimalist in everyone. This simple but functional design can fit into any minimalist or industrial design loft. The garment rack is perfect for a small apartment that doesn’t have closet space. The wheels mean that it can be moved around a small space as needed. This galvanized steel pipe frame matches the bed frame mentioned above and can be used for the same reasons. The silver finish lightens the piece and surrounding area. This particular design features reclaimed boxcar planks, each with its own unique history. Each is completely unique with a different mix of wood and different distress patterns. This can also be a trendy alternative to a coat rack in your entryway. 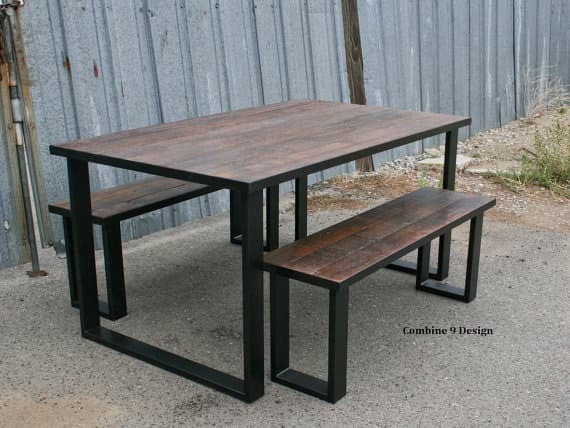 Industrial furniture pieces can be expensive as they are usually custom made and unique. 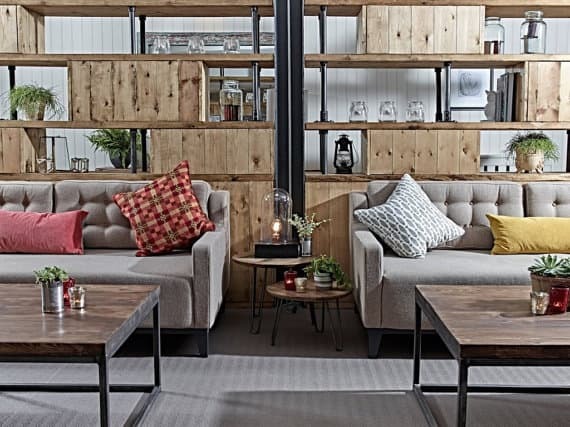 If you’ve found a piece of reclaimed wood that you love, but don’t know how to incorporate it into your industrial style loft, consider doing a little by of DIY. This salvaged and reclaimed metal leg brackets can turn any piece of wood into a piece of industrial loft furniture in an afternoon! By using these brackets, you are able to treat, stain, or distress the wood any way you choose to create a completely custom table. At only 20 cents each, these are a completely affordable way to enhance your industrial décor. 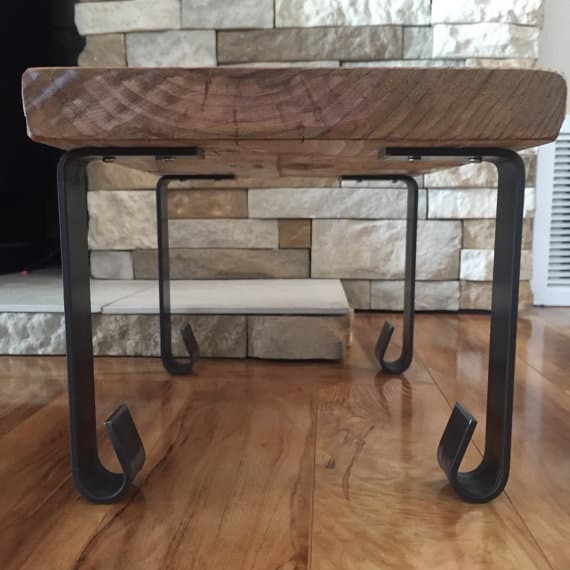 One idea for these table legs is to create matching side tables. Often times, it’s hard to find matching pieces of industrial furniture due to their unique nature. However, with these table legs, you can use one piece of reclaimed wood to create a symmetrical layout in your home. This piece of industrial décor is the one that will probably define your space the most. 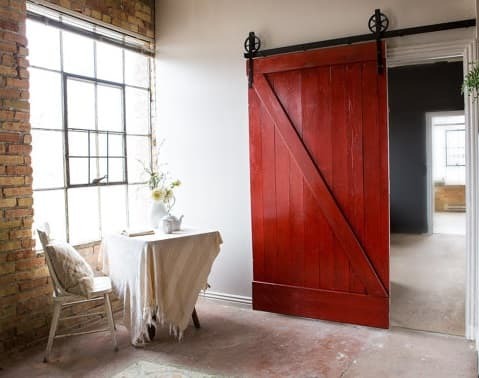 Similar to a barn door, a factory door is a heavy door that slides on a track horizontally. 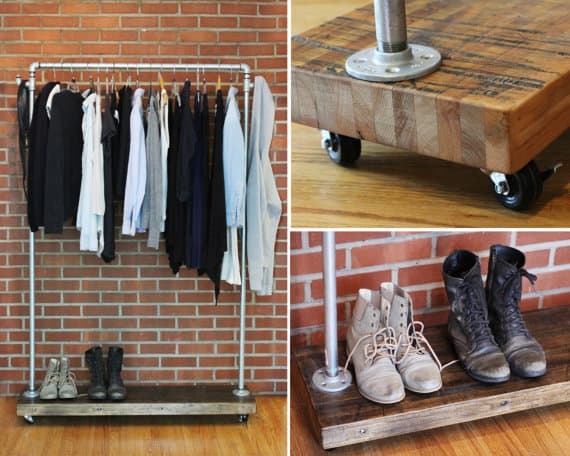 This is perfect for those who want to capture the industrial style of a repurposed warehouse. This particular door is made from distressed wood and exposed metal hardware. This gives the door an added industrial touch.